Six months after admitting it had misstated viewership stats, the social network is touting its products with emotional films aimed at media buyers and the creative community. Facebook has been on the ropes regarding its video ads of late, but now it’s going on the offensive. 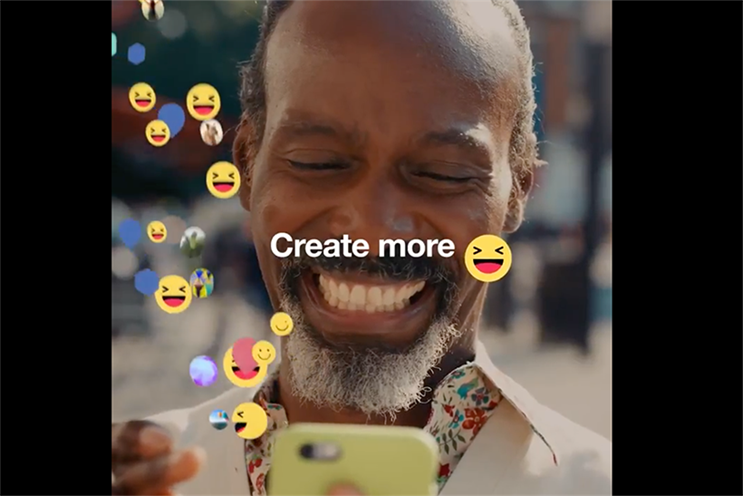 Starting last week, Facebook has embarked on a far-reaching campaign to show media agencies and the creative community around the world just how powerful mobile video ads can be. Through mobile videos and out-of-home and print ads, the campaign will demonstrate how video ads optimized by mobile can be an effective way to tell emotional stories and bring results. "Video has always created an emotional reaction with people, whatever form it’s in," said Michelle Klein, Facebook’s head of global business marketing for North America. "Emotional reactions help brands build connections with consumers and ultimately that drives equity and sales." The effort comes at a critical time for Facebook and its dreams of dominating the video ad market. In September, it admitted that it misled advertisers with overstated video metrics for the past two years. Furious, agency executives chimed back, demanding Facebook adopt third party verification partnerships. Jared Folkmann, group strategy director at Critical Mass, said at the time that the lack of third party verification is like the platform "marking its own homework." In November, marketers got their wish when Facebook adopted third-party metrics and a measurement council, promising more transparency in the future. Now, the new campaign works to reinstate what Facebook’s family of video ad products can do, including those on Instagram and through its Audience Network. While it’s not the platform’s first campaign targeting agencies and brands, it’s the first to focus on mobile video ads. "It’s a significant campaign," said Klein. "We wanted to create a fully integrated marketing platform around a very important area that our clients are trying to move quickly into." The first phase of the campaign, which runs through May, centers on 15-second videos that feature people reacting emotionally to mobile video. Two spots are now running on Facebook and Instagram, and are specifically targeted to US media agencies, brand marketers and their employees. "Make them laugh, cry, wow and buy," reads the ads. Five more short videos will run in the coming weeks. Out-of-home and print ads will soon supplement these videos. On March 20th, out-of-home ads will appear in New York and Chicago, cities with large populations of media executives. 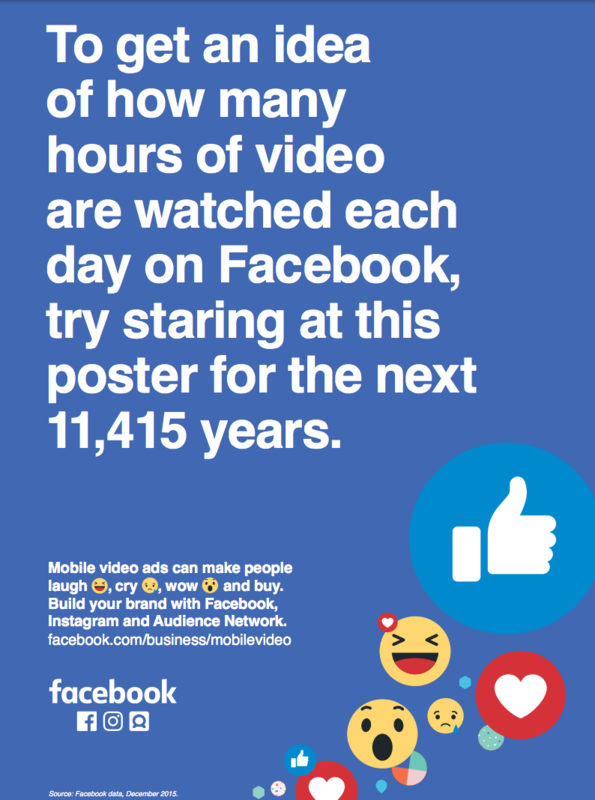 One such ad presents Facebook research showing how much time users spend watching mobile videos. The print ads will appear in AdAge. Facebook will then try debunking some of the myths surrounding mobile videos. Last November, the platform spent time with various focus groups made up of media agencies and key clients to understand the barriers marketers were experiencing with mobile video ads. Several video ads will address the responses they received, such as the idea that a small screen can’t elicit the same degree of emotion as a traditional TV spot. The company, which is based in Menlo Park, Calif., plans to introduce client case studies to the campaign in April. One future video, for instance, will show how sparkling water brand Perrier saw a 17-point lift in ad recall and a four-point lift in purchase intent after using mobile video ads. The second phase of the campaign, which launches in May, will be aimed at the entire creative community, but particularly creative directors and brands. Klein said that those ads will showcase "a lot of the demo-tainment around what you can do with mobile video and the creative canvas that it enables." Klein said the global marketing team spent an extensive amount of time planning how to create the ads. "Part of our creative process," said Klein, "was to ‘eat our dog food,’" meaning to utilize the same advice it gives to advertisers. Klein’s team aimed to engage viewers in the first couple of frames, use short videos, place a call-to-action right away, design for muted sound and use emoticons to translate a visual identity. Klein’s team "soft launched" the campaign at SXSW last week. Interactive photo booths allowed people to create their own Facebook carousel ads using the emoticons that appear in the new campaign. "We wanted to have our clients go to a physical manifestation of the idea," she said. Both phases of the campaign will begin in the US and extend to other countries after five months. The timing is strategic. "This is the first half of the year and an important time when clients are making decisions around their overall plan for the year," said Klein. "And we have all of these amazing products, some of them are very new." Most recently, in February, Facebook updated the look of mobile video ads with larger vertical videos, after discovering that users prefer the size.